Will Wargaming sell skins for the old ships like Yamato? There is a T10 perma-camo that you can buy for Yamato. There was an HSF event to earn a Yamato camo a few months back. Its been awhile since I've been back. Where can you buy it? in game shop? In game, go to the camo screen. The upper left corner will have the perma-camo. For T10 ships it costs 5,000 doubloons. Do you have a screenshot? I cannot seem to find the button. I find a button to change the port. 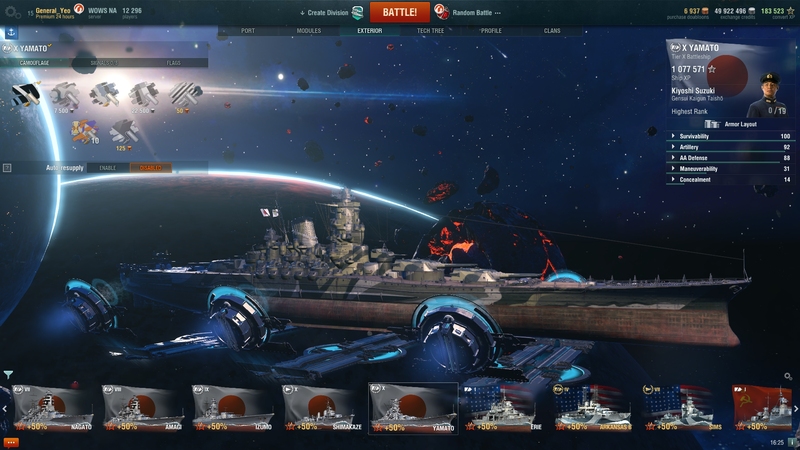 In your screen shot, you already have the Yamato perma-camo. It is the checked one in the picture. Thats not the apollo skin though. I was looking for where to acquire the Yamato Apollo skins. I think you might be looking for a mod then. I don't use mods, so I would not know where to find the mod with apollo skins. Wargaming is selling the Apollo skins in the premium shop right now. I was wondering when/if they would sell them for the old ships. My understanding is there is no need for an additional mod. Those camos were only for the ships that were a part of the space battles event. Yamato was not one of the ships used in that event. I'm assuming you're talking about the space skins. Yamato does not have one. You might also be thinking about the first space battles from cbt, but that wasnt a camo you could buy and was temporary. More bad news. Wargaming's contract with ARP ended. My motivation to play has quickly dwindled. HSF Graf Spee and HSF Harakaze (Kagero clone) are in the shop. The HSF Yamato camo was awesome, Free Tier X Perma-Camo!